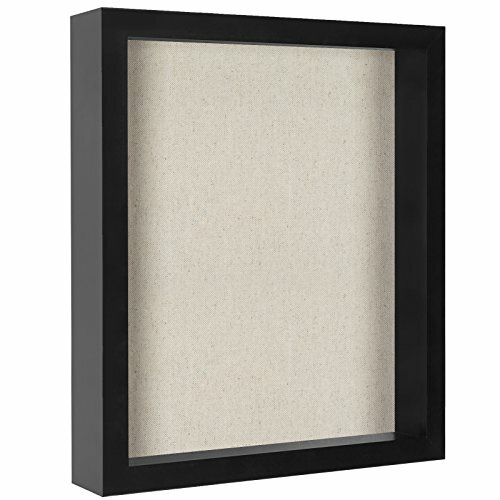 Americanflat 5 pack - black shadow box frames are perfect for collecting and preserving your most precious memories. Gather your memorabilia throughout the years, and place it in a creative way inside these high-quality shadow box frames using push pins on the linen backings. These frames are so versatile, you can also remove the inside pieces of wood to use them as normal frames. Sized 11x14 inches, and 2 inches in depth, these frames are the perfect size for a tabletop or wall mounting displays. Come with hanging hardware pre-installed on the backs. No assembly required! Keep them for yourself, or give as gifts to loved ones. Great for birthdays, holidays, anniversaries, weddings, or any other special occasion! Make your memories last a lifetime inside these gorgeous home decor products. Order with confidence and click "add to cart" today! PRESERVE YOUR MEMORIES: These black shadow box frames are perfect for creating and protecting your own display of memorabilia. Preserve your memories that will last a lifetime in these high-quality shadow box frames. Pin your past concert tickets, awards and photos to the back linen boards and protect your most precious memories. MATERIALS AND SIZE: These frames have crystal clear glass to showcase your memorabilia. The frames allow you to place the glass flush against the back for photos and other flat items as well as against the front to create space between the backs and the glass. 6 silver pins are included with each frame! The frames are size 11x14 inches, and are 2 inches deep. USE AND DISPLAY: Create your own unique showcase of your most precious memories. You can also use this as a regular picture frame, by simply removing the inner piece of wood! This shadow box frame comes with a sawtooth hanger pre-installed on the back, so no assembly is required. Hang it on the wall to make it stand out in any room, or place it on a tabletop or mantel to go with other decor items. Perfect for your home or office space. VERSATILE PRODUCT: This shadow box can be used 2 ways! The shadow box ships with glass flat against the back of the frame for safety reasons. Use this way to create a deep frame effect for all of your 11x14 inch photos. As an alternative, take the removable wooden insert from the interior of the frame and position the glass towards the front of the frame. This will create a true shadow box, allowing you to pin photos and add 3D elements. PROTECTIVE PACKAGING: Americanflat developed exclusive proprietary packaging that helps ensure safe delivery of products. Quality and satisfaction guaranteed. Order with confidence, click and add to cart today!